Washoe County is a county in the U.S. state of Nevada. 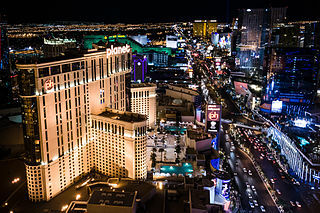 As of the 2010 census, the population was 421,407, making it Nevada's second-most populous county. Its county seat is Reno. The town of Verdi was named after Giuseppe Verdi by Charles Crocker, founder of the Central Pacific Railroad, when he pulled a slip of paper from a hat and read the name of the Italian opera composer in 1868. The name is pronounced by the local population as VUR-dye. 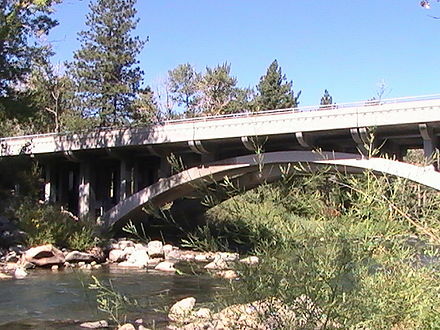 Third Street (Old U.S. Route 40) passes over the Truckee River, as seen from Crystal Peak Park in Verdi. Verdi is located at 39°31′6″N119°59′19″W﻿ / ﻿39.51833°N 119.98861°W﻿ / 39.51833; -119.98861 (39.5183, -119.9887) on the western border of Nevada, adjacent to the California state line. In February 2008 an earthquake swarm began, and ended in June 2008. The total number of earthquakes in the census-designated place reached over 5,000 and ranged in magnitude from 0.7 to 4.7 on the Richter magnitude scale. Earthquake swarms are events where a local area experiences sequences of many earthquakes striking in a relatively short period of time. The length of time used to define the swarm itself varies, but may be of the order of days, weeks, or months. They are differentiated from earthquakes succeeded by a series of aftershocks by the observation that no single earthquake in the sequence is obviously the main shock. The Verdi area is served by the Washoe County School District. Verdi is home to two of the closest Nevada casinos and RV parks to California on I-80:  Terrible's Gold Ranch Casino, now known simply as Gold Ranch Casino, at Exit 2 and the Boomtown Reno at Exit 4. 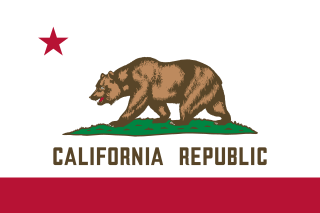 Nearby is the closest Cabela's to California. 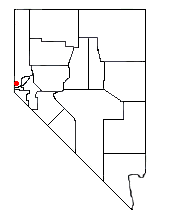 Moapa is an unincorporated town and census-designated place (CDP) in Clark County, Nevada, United States. The population was 1,025 at the 2010 census. It is the largest town in Clark County by land area. Both the second and the third tallest structures in Nevada, the Moapa Entrevision Tower and the Moapa Kemp Tower respectively, are located in Moapa. Paradise is an unincorporated town and census-designated place (CDP) in Clark County, Nevada, United States, adjacent as a suburb to the city of Las Vegas. 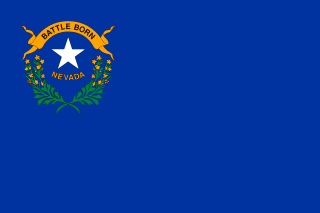 The population was 223,167 at the 2010 census, making it the most populous unincorporated community in Nevada. As an unincorporated town, it is governed by the Clark County Commission with input from the Paradise Town Advisory Board. Paradise was formed on December 8, 1950. Johnson Lane is a census-designated place (CDP) in Douglas County, Nevada, United States. It lies in the south side of the Carson City metropolitan area. The population was 6,490 at the 2010 census. Dayton is a census-designated place (CDP) in Lyon County, Nevada, United States. The population was 8,964 at the 2010 census. The micronation of Molossia is located in Dayton. Lemmon Valley–Golden Valley is a former census-designated place (CDP) in Washoe County, Nevada, United States. For the 2010 census it was replaced by two separate CDPs, Lemmon Valley and Golden Valley. The population of the combined CDP was 6,855 at the 2000 census. The area is a northern suburb of the city of Reno and is part of the Reno–Sparks Metropolitan Statistical Area. Spanish Springs is a census-designated place (CDP) in Washoe County, Nevada, United States. It is located in the northeastern part of the Reno–Sparks Metropolitan Statistical Area. The population was 15,064 at the 2010 Census. Sun Valley is a census-designated place (CDP) in Washoe County, Nevada, United States. The population was 19,299 at the 2010 census. It is north of Reno and is part of the Reno–Sparks Metropolitan Statistical Area. Sutcliffe is a census-designated place (CDP) in Washoe County, Nevada, United States. The population was 253 at the 2010 census. It is part of the Reno–Sparks Metropolitan Statistical Area. The Reno Metropolitan Statistical Area, as defined by the United States Census Bureau, is an area consisting of two counties in western Nevada, anchored by the cities of Reno and Sparks. As of the 2010 census, the MSA had a population of 425,417. Washoe Valley is a census-designated place (CDP) in Washoe County, Nevada, United States. It corresponds closely to the unincorporated community of New Washoe City. The population was 3,019 at the 2010 census. It is part of the Reno–Sparks Metropolitan Statistical Area. The CDP takes its name from the Washoe Valley, a region between Reno and Carson City centered on Washoe Lake. 1 2 3 "Geographic Identifiers: 2010 Demographic Profile Data (G001): Verdi CDP, Nevada". U.S. Census Bureau, American Factfinder. Retrieved January 17, 2013. ↑ Carlson, Helen S. (1985). Nevada place names : a geographical dictionary. Reno: University of Nevada Press. p. 238. ISBN 0-87417-094-X. 1 2 3 "Profile of General Population and Housing Characteristics: 2010 Demographic Profile Data (DP-1): Verdi CDP, Nevada". U.S. Census Bureau, American Factfinder. Retrieved January 17, 2013. ↑ "Selected Economic Characteristics: 2007-2011 American Community Survey 5-Year Estimates (DP03): Verdi CDP, Nevada". U.S. Census Bureau, American Factfinder. Retrieved January 17, 2013. Wikimedia Commons has media related to Verdi, Nevada .